Did you know that DART has a bus stop or rail station within walking distance of more than 30 North Texas trade schools, colleges and universities? As part of our Destination: North Texas series, we are exploring all the educational opportunities North Texas has to offer, and how DART is committed to making sure these institutions are accessible to students across our region. We’re not just talking about our universities and colleges when we talk about education in North Texas. Quality public schools, community colleges, and professional and post-graduate programs not only improve the quality of life for our residents, but also make North Texas a destination for anyone seeking a quality education. SCHOOL SPOTLIGHT: Dallas County Community College District (DCCCD) is one of the largest community college systems in Texas and it is entirely accessible by DART Transit! All seven of these community college locations equip students for hands-on training to prepare them for successful living. Whether you’re looking to enhance your skills through noncredit courses, or gain a degree with college credit courses, DCCCD is equipping all students with the knowledge they need to succeed. SCHOOL SPOTLIGHT: Named as one of the five Distinguished Schools in the Arts Booker T. Washington High School for the Performing and Visual Arts, is a top-tier performing arts high school that boasts over 18 presidential scholars and 194 DeeBee awards. Whether you’re a painter, an actor, a writer, or a dancer, Booker T. Washington is the place where you can nurture your skills and grow your craft. A quick walk from the blue, orange, and red line; students are close to transit and steps away from making taking their education from the classroom to the real-world thanks to access to transit. Access to public transit can be a huge factor in choice when students look at schools. Two of our larger universities here in North Texas, Southern Methodist University and the University of Texas at Dallas are both located near DART transit, allowing students to still experience all the region has to offer without relying on a personal vehicle. Furthermore, DART offers discounted passes to full-time students. We believe that everyone – no matter their financial or mobility situation – should have access to quality education. 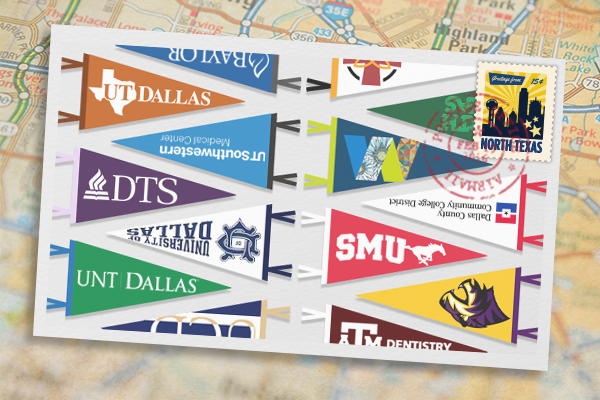 DART is proud to support these education institutions, they’re part of what makes North Texas a destination. We want to make sure residents and students have the access and the flexibility to pursue the education they desire! This entry was posted in dartable, General. Bookmark the permalink.